MT Digital Belt Textile Printer is the latest developed direct ink-jet equipment that can print on various textile fabrics directly in recent years. It absorbs the most function and feature of traditional textile printer, but add the auto-washing device and drying system for print textile fabric. MT Digital Belt Textile Printer adopts the advanced servomechanism system to assure the precision of printing. It realized Digital Belt Textile printing on Silk, Linen, cotton, spandex, polyester, towel, blanket, man-made fabric and so on. It brings the revolution on textile printing and dyeing technology and really reflects the individual market requirement that small-lot and quick response! Meanwhile, MT Digital Belt Textile Printer realizes the green process with low energy consumption, non-pollution, noiseless. The print speed becomes faster, the cost of consumption items decrease, so it brings enormous impact on traditional textile printing machine. Silk has long been considered the most luxurious of fabrics, thus nicknames the “queen of textiles”. Although China managed to contain the monopoly of producing silk for a long time, it was finally introduced to Europe around the 13th century and then spread to the rest of the world. Silk is widely appreciated not just for its rich appearance, but also for its smooth feel, insulating properties and natural strength. Since it yields itself well to dyes, it is available in a huge array of beautiful designs. Depending on the intended usage, the silk weave can be modified and is versatile enough to be crafted into everything from ties, scarves, shirts and saris, even curtains, bedspreads and upholstery. In India, silk is the undisputed fabric of choice for traditional, elegant garments such as saris, shawls, stoles and kurtas. From traditional printing methods such as hand-block and dye prints, to digital inkjet Silk Printer printing techniques, silk is open to all. The MT digital Silk Printer distinguishes itself amongst competitors as the China’s leading digital textile printer manufactory who service for individual designers, textile design studios and international textile printer retailers. Our luxurious digital Silk Printer digitally printed fabric including silks parade catwalks, while the home-interiors market can print finest quality printing fabric. Top end quality digital textile silk printer, where there are no limitation in use of color and print. Scanned images from art and photos, designs with multiple colors and grading in the color use, are printed with stunning results, all orders printed on exclusive basis by digital silk printer. Furthermore, digital silk printer provided short sampling orders and production orders services. Digital textile printing meets the demand for the individual fashion design concept. 1. New digital textile inkjet control system is equipped with Natural Fiber Silk Belt Printers. It supports variable dots size setting to provide higher ink covering volume per unit in order to improves higher production capacity. 2. High-speed printing! Epson DX5, Ricoh Gen5 or Xaar1201 industry grade printheads are optional for Digital Silk Printers. Those are the most popular printheads for digital textile printing industry in the world, especially in Europe and North America. Because, it suit for big lots continue and unstoppable industrial production. They are high durability and high resolution printheads to provid the printing speed up to 100 sqm/h, which can meet the demand of volume production for digital textile fabric printing. 3. Natural Fiber Silk Belt Printers can match the width on fashions and home textile application request. It can print and produce various colorful textile fabrics that can be used in our life. The maximum printing width for MT digital Belt Textile Printer is 1.8m. 4. Digital Silk Printers provide Professional textile belt carrier system. This system can carry the textile fabric without tension, suit for both of the stretchable and un-stretchable textile fabric. 5. Natural Fiber Silk Belt Printers support various textile dye inks, suit for different types of fabric. a. It supports textile Reactive inks, can print on silk, cotton, linen, wool fabrics. b. It supports textile Acid inks, can print on silk, wool fabrics. c. It supports textile Pigment inks, can print on various fabrics without pre-treatment and aftertreatment on fabric. d. It supports textile Disperse (sublimation) ink, which can print on polyester fabric. 6. 4 or 8 colors ink is available for Natural Fiber Silk Belt Printers. They are really support double 4 colors and CMYK plus 4 special Neon colors(fluorescence colors) printing, be able to get wider color gamut. 7. Digital Silk Printers equip with all in one fabric feeding in and rewinding system, plus three sets of fabric drying heater unit. It can be carry the fabric stably feed in and drying the fabric completely after printing, then printed fabrics rewinding by automatic take up system, which avoide color blur. 8. All-in-one computer operation platform equip with Natural Fiber Silk Belt Printers. 9. 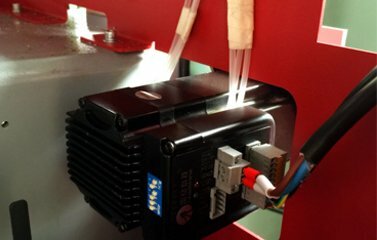 Printhead printing height is adjustable for Digital Silk Printers. 10. No need to make plate, suitable for both sampling and lots size production. 11. Natural Fiber Silk Belt Printers equip with Bulk Ink Continue Supply System. The Belt Textile Printer installs 8 bulk ink tanks (2L/tank) and 8 cartridges (220ml/pic) that will keep long time stable working with non-stop ink supply. 12. Digital Silk Printers adopt Advanced Belt conveyor device with Auto Deviation Correction system. a. Import German “Sieglin” is equipped with Digital Silk Printers. Conveyor belt is especially for digital textile printing; it can work over 10 years. b. Belt system automatically adjusted by PLC sensor and motor. c. Belt Glue: oil based, prevents fabric dislocation or movement, even elastic fabric can be printed as well. d. Front and back Belt shafts diameter up to 200mm. e. Bracket props up the belt and makes it smooth. f. Installing lifting sprayer device to fit varied fabric. 13. Belt auto self-clean & drying system is equipped with Digital Silk Printers. a. 2pcs sponge shafts instead of brush to protect the belt better and prolong the belt glue Life span. b. Water-cycled pipe to keep the water tank and sponge clean. c. The washing system height and pressure is adjustable. 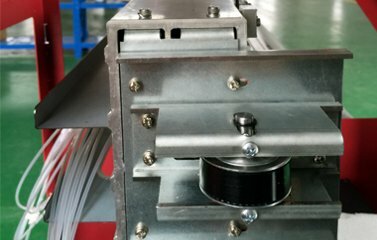 d. After washing, the PID controlled drying system can dry the belt effectively during continue printing. Natural Fiber Silk Belt Printers are digital textile printer series and developed by MT Industry with great efforts and great capital invested. Based on the strong ability and rich experience in digital textile inkjet technology, MT will supply full support for digital textile inkjet printer to all users. As the China’s leading digital silk fabric printer manufactory, we are proud to help so many up and coming, as well as internationally recognized design companies to make their creativity come to life. As digital textile printer specialists, we bring in depth knowledge and experience in traditional and digital textile printing. Our high quality printers printing work is achieved by only using the highest quality acid ink, reactive ink and disperse dyes ink. MT digital silk printers have been digital printing on silk fabric for years, supplying you with customized prints that you will love. If you want to print on silk then we highly recommend using one of our favorites, the digital belt Silk printer. This printer is perfect for making all size scarves and wraps, luxury garments, lingerie, dresses, and accessories and 100% show through and super soft to touch after printing. Digital belt silk printer are experts at making your designs come to life on the highest grade silk and our specialist digital silk printer printing techniques ensure strong and permanent print. Digital textile silk printer perfect for making customized scarves, wraps, silk ties, luxury garments, lingerie, dresses, and accessories. Fashion designers can use MT Digital silk printer for a wide range of creative and unique ideas. MT silk printers are experts at making your designs come to life on the highest grade silk with strong colors. Couture designers, silk tie makers, bridal and lingerie makers use MT digital silk printer custom printed silk. Occasionally film and theater productions use MT digital belt silk printer for printing scene or dressmaking. Interior designers also use our Digital textile silk printer for specific requirements in fine detailing and luxury finishes. Natural Fiber Silk Belt Printers are applied in textile printing Industry to replace traditional silk printing techniques, which is the solution of both large batch & small batch, low cost, fast printing requirements. The productive printing speed and width options achieve the possibility of meeting the fabrics printing requirements with digital printing method.